April 2007 was a significant day for beekeepers in Australia. It saw the first arrival of the Asian honeybee in Australia - Cairns in far north Queensland to be exact – a mere 350km up the road from Townsville. 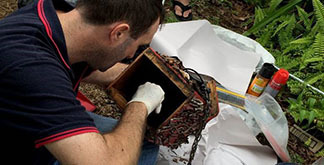 An established nest was identified by local beekeepers in May that year and destroyed by Biosecurity Queensland. By the end of 2007, five nests were detected and destroyed and within four years 486 nests were destroyed. These statistics are testimony to the awesome dispersal capacity of this species. At least three further incidents of the accidental arrival through the port of Townville are known, the most recent in March 2014. Thankfully all three were detected and destroyed before becoming established. What do we know about the Asian honey bee? This bee is normally found throughout most of Asia, including India, China, Japan, Philippines and Indonesia. It was introduced into western Papua New Guinea by Indonesians and soon got out of control. In 2003 it was detected in the Solomon Islands. Within five years it had reduced the 2000 managed hives of European honey bees by 95%. Unlike the European honey bee, the Asian bee is difficult to domesticate and use for honey production or pollination. This is because of its tendency to abscond from its home at the slightest disturbance and to maintain relatively small colonies which divide and swarm regularly throughout the year. It stores little honey itself and competes with the European honey bee for floral resources. Unlike the European bee, it is can forage in light and even in moderate rainfall making the most of every feeding opportunity. Concern among beekeepers is twofold: Firstly, the experience from overseas countries is that the Asian bee can out-compete the European bee and can severely impact local beekeeping industries. So far, it's impact on beekeeping in Australia is small, but this might change rapidly as the AHB spreads beyond it's current invasion area in North Queensland. A concerted effort by a few BioSecurity staff and a small band of beekeeping volunteers has restricted its spread to Innisfail, 100km south of Cairns and to the Atherton Tablelands, 90km southwest of Cairns. Unfortunately, there has since been a second incursion of the Asian honey bee since through the port of Townsville (see below). The other area of concern is that in its native home, the Asian bee is a known to carry of the Varroa mite, a parasite that attacks bee larvae and even adult bees. No mites have been detected on the bees from the Cairns infestation but mites were found on bees from the Townsville infestation. After two weeks of intensive surveillance this is the only new hive of Asian honey bees to be located. Photo: Biosecurity Queensland. Laboratory examinations of an Asian honey bee hive found at Annandale this week have confirmed the presence of varroa mites. Dr Bunce said the current varroa mite response was initiated after a feral Asian honey bee hive was found last month at the Port of Townsville. “Those bees were carrying a small number of varroa mites which present a real threat to the honey bee industry and plant industries that rely on bees for pollination,” he said. “While these mites are not the more serious Varroa destructor, we are taking this incident very seriously and putting every effort into ensuring they are eradicated. If you know of feral bee hives in the Townsville area, or see Asian honey bees or suspect your bees have been affected, call Biosecurity Queensland on 13 25 23. Information about bee biosecurity, hive care, and photos that will help you identify varroa mite is here. More information on Asian honey bees, their appearance and associated symptoms once infected with varroa mites is available online at biosecurity.qld.gov.au, or view the varroa mite pest alert. Follow Biosecurity Queensland on Facebook and Twitter (@BiosecurityQld). Reproduced from a biosecurity alert issued by Biosecurity Queensland. What do Asian honey bees look like? Asian honey bees will be hard for ordinary people recognize unless they are quite familiar with European honey bees. While they have the same shape, the Asian honey bee on the left is much smaller than the European honey bee on the right. When seen together, Asian honey bees also look much more "stripey" than European honey bees.